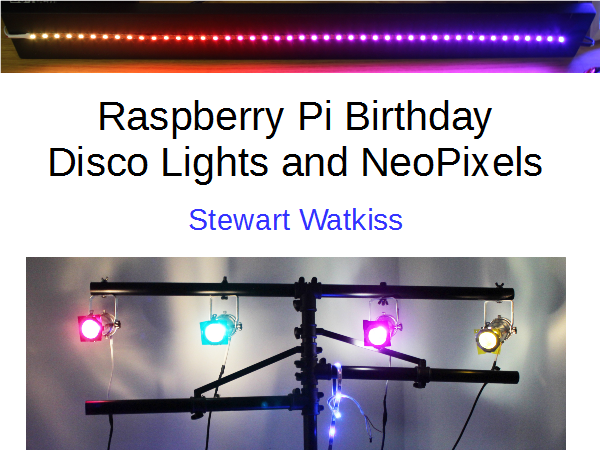 Click the image above for the slides for the Disco Light talk at the Pi Birthday 2016. Below is a worksheet giving hands-on with connecting up NeoPixels to a Raspberry Pi using a breadboard. This uses breadboard NeoPixels. These do need a little soldering initially, but once soldered can be easily connected to the breadboard and reused as required. Note that some breadboard NeoPixels use a different pin layout, so you may need to modify your design accordingly. The following is an alternative using through-hole NeoPixel LEDs with no soldering required. There is a potential problem with NeoPixels due to an incompatibility between the sound driver and the code used to control the NeoPixels. This can be avoided by blacklisting the sound driver to prevent it from loading. The worksheets above include the following instructions, but older versions of the worksheet may not. Now reboot the Raspberry Pi before running the test program. For more information see the NeoPixels page in Penguintutor electronics information.